“Atheist” redirects here. For other uses, see Atheist (disambiguation). Definitions of atheism also vary in the degree of consideration a person must put to the idea of gods to be considered an atheist. Atheism has sometimes been defined to include the simple absence of belief that any deities exist. This broad definition would include newborns and other people who have not been exposed to theistic ideas. As far back as 1772, Baron d'Holbach said that "All children are born Atheists; they have no idea of God." Similarly, George H. Smith (1979) suggested that: "The man who is unacquainted with theism is an atheist because he does not believe in a god. This category would also include the child with the conceptual capacity to grasp the issues involved, but who is still unaware of those issues. The fact that this child does not believe in god qualifies him as an atheist." Implicit atheism refers to "the absence of theistic belief without a conscious rejection of it" and explicit atheism refers to the definition of conscious rejection of belief. For the purposes of his paper on "philosophical atheism", Ernest Nagel chose to attach only the explicit atheism definition for his examination and discussion. Graham Oppy classifies as innocents those who never considered the question because they lack any understanding of what a god is. According to Oppy, these could be one-month-old babies, humans with severe traumatic brain injuries, or patients with advanced dementia. In recent years, the profile of atheism has risen substantially in the Arab world. In major cities across the region, such as Cairo, atheists have been organizing in cafés and social media, despite regular crackdowns from authoritarian governments. A 2012 poll by Gallup International revealed that 5% of Saudis considered themselves to be "convinced atheists." However, very few young people in the Arab world have atheists in their circle of friends or acquaintances. According to one study, less than 1% did in Morocco, Egypt, Saudia Arabia, or Jordan; only 3% to 7% in the United Arab Emirates, Bahrain, Kuwait, and Palestine. 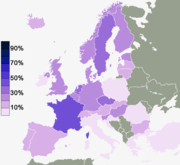 When asked whether they have "seen or heard traces of atheism in [their] locality, community, and society" only about 3% to 8% responded yes in all the countries surveyed. The only exception was the UAE, with 51%. ^ a b c d "Epicurus (Stanford Encyclopedia of Philosophy)". Plato.stanford.edu. 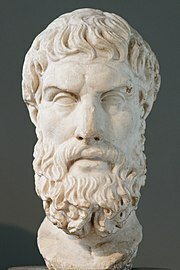 http://plato.stanford.edu/entries/epicurus/. Retrieved 2013-11-10. ^ a b Stein, Gordon (Ed.) (1980). "The History of Freethought and Atheism Script error". An Anthology of Atheism and Rationalism. New York: Prometheus. Retrieved 2007-APR-03. "Atheism". Catholic Encyclopedia. New York: Robert Appleton Company. 1913. ^ Ferguson, Everett (1993). Backgrounds of Early Christianity (second ed.). Grand Rapids, Michigan: William B. Eerdmans Publishing Company. pp. 556–561. ISBN 0-8028-0669-4. ^ a b (April 1964) "Why Were the Early Christians Persecuted? -- An Amendment". Past and Present (27): 23–27. ^ a b Maycock, A. L. and Ronald Knox (2003). Inquisition from Its Establishment to the Great Schism: An Introductory Study. ISBN 0-76617290-2. ^ Freethought Traditions in the Islamic World Script error by Fred Whitehead; also quoted in Cyril Glasse, (2001), The New Encyclopedia of Islam, p. 278. Rowman Altamira. ^ "Online Etymology Dictionary". http://www.etymonline.com/index.php?term=pantheism. Retrieved 2013-11-26. ^ "Michel Onfray on Jean Meslier". William Paterson University. http://nova.wpunj.edu/newpolitics/issue40/Onfray40.htm. Retrieved 2011-11-04. ^ d'Holbach, P. H. T. (1770). The System of Nature. 2. http://fulltextarchive.com/page/The-System-of-Nature-Vol-21/. Retrieved 2011-04-07. ^ "Reflections on the Revolution in France". adelaide.edu.au. http://ebooks.adelaide.edu.au/b/burke/edmund/reflections-on-the-revolution-in-france/. ^ Ray, Matthew Alun (2003). Subjectivity and Irreligion: Atheism and Agnosticism in Kant, Schopenhauer, and Nietzsche. Ashgate Publishing, Ltd.. ISBN 978-0-754-63456-0. https://books.google.com/?id=BKz2FcDrFy0C&pg=PA1. Retrieved 2011-04-09. ^ Law, Stephen (2011). Humanism. A Very Short Introduction. Oxford University Press. p. 23. ISBN 0-19955364-5. ISBN 978-0-199-55364-8. https://books.google.com/books?id=Xa7KOJvM2MMC&printsec=frontcover. ^ Holyoake, G.J. (1896). The Origin and Nature of Secularism. Showing that where Freethought Commonly Ends Secularism Begins. London: Watts. pp. 41ff.. https://books.google.com/books?id=WnxPAAAAYAAJ. ^ Rowan Callick; Party Time – Who Runs China and How; Black Inc; 2013; p.112. ^ "White Paper—Freedom of Religious Belief in China". Embassy of the People's Republic of China in the United States of America. October 1997. http://www.china-embassy.org/eng/zt/zjxy/t36492.htm. Retrieved 2007-09-05. ^ "International Religious Freedom Report 2007 — China (includes Tibet, Hong Kong, and Macau)". U.S.Department of State. 2007. https://www.state.gov/g/drl/rls/irf/2007/90133.htm. Retrieved 2007-10-02. ^ Madsen, Richard (2014). "Religion Under Communism". In Smith, S. A.. 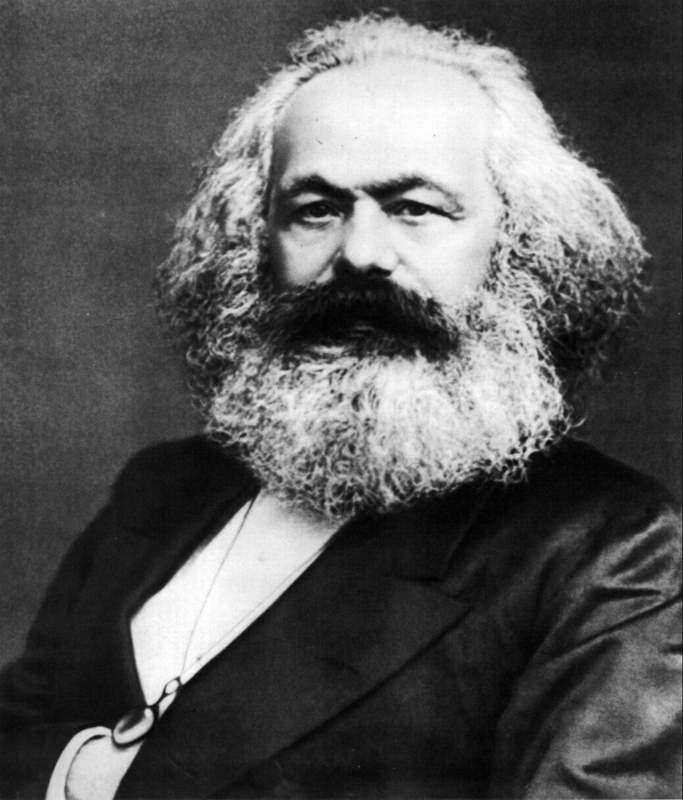 The Oxford Handbook of the History of Communism. Oxford University Press. p. 588. ISBN 978-0-199-60205-6. https://books.google.com/books?id=ZMd7AgAAQBAJ&lpg=PA172&pg=PA586. ^ Blackford, R.; Schüklenk, U. (2013). "Myth 27 Many Atrocities Have Been Committed in the Name of Atheism". 50 great myths about atheism. John Wiley & Sons. p. 88. ISBN 978-0-470-67404-8. https://books.google.com/books?id=fR1rAAAAQBAJ&lpg=PA79&pg=PA85. ^ Michael, S. M. (1999). "Dalit Visions of a Just Society". In Michael, S. M.. Untouchable: Dalits in Modern India. Lynne Rienner Publishers. pp. 31–33. ISBN 1-55587697-8. ^ Martin, Douglas (26 August 2006). "Vashti McCollum, 93, Plaintiff In a Landmark Religion Suit – Obituary (Obit); Biography". New York Times. https://www.nytimes.com/2006/08/26/obituaries/26mccullum.html. Retrieved 2013-11-10. ^ Jurinski, James (2004). Religion on Trial. Walnut Creek, California: AltraMira Press. p. 48. ISBN 0-75910601-0. https://books.google.com/?id=0Yq_z5LaCjsC&pg=PA48&lpg=PA48. Retrieved 2009-07-23. ^ Erickson, Doug (25 February 2010). "The atheists' calling the Madison-based Freedom From Religion Foundation is taking its latest battle to the U.S. Supreme court. It's a milestone for the often-vilified but financially strong group, which has seen its membership grow to an all-time high". Wisconsin State Journal. http://host.madison.com/news/the-atheists-calling-the-madison-based-freedom-from-religion-foundation/article_85a849c9-f26a-50e8-8a04-cf8bc889d8a0.html. Retrieved 2013-06-30. ^ Erickson, Doug (25 February 2007). "The Atheists' Calling". Wisconsin State Journal. http://host.madison.com/news/the-atheists-calling-the-madison-based-freedom-from-religion-foundation/article_85a849c9-f26a-50e8-8a04-cf8bc889d8a0.html. Retrieved 2013-11-21. ^ (2007) "Why the Gods Are Not Winning". Edge 209. Retrieved on 2011-04-09. ^ "Women in Secularism". Archived from the original on 30 July 2013. https://web.archive.org/web/20130730235818/http://www.womeninsecularism.org/2012/. Retrieved 2013-11-21. ^ "Secular Woman:About". Archived from the original on 21 November 2013. https://archive.is/20131121223333/http://www.secularwoman.org/about. Retrieved 2013-11-21. ^ "A Timeline of the Sexual Harassment Accusations". http://freethoughtblogs.com/greta/2013/08/13/a-timeline-of-the-sexual-harassment-accusations/. Retrieved 2013-11-21. ^ "Blaghag: Atheism+". http://freethoughtblogs.com/blaghag/2012/08/atheism/. Retrieved 2013-11-21. ^ "How I unwittingly infiltrated the boys club, why it's time for a new wave of atheism". http://freethoughtblogs.com/blaghag/2012/08/how-i-unwittingly-infiltrated-the-boys-club-why-its-time-for-a-new-wave-of-atheism/. Retrieved 2013-11-21. ^ "About Atheism+". Archived from the original on 22 August 2013. https://web.archive.org/web/20130822080733/http://atheismplus.com/faq.php. Retrieved 2013-11-21. ^ "First atheist monument on government property unveiled". Alligator News. http://www.alligator.org/news/local/article_f9a8713c-e2cf-11e2-b9d8-001a4bcf887a.html. Retrieved 2013-11-21. ^ "Atheists unveil monument in Florida and promise to build 50 more". http://www.rawstory.com/rs/2013/06/29/atheists-unveil-monument-in-florida-and-promise-to-build-50-more. Retrieved 2013-11-21. ^ Hooper, Simon. "The rise of the New Atheists". CNN. Archived from the original on 8 April 2010. https://web.archive.org/web/20100408094135/http://www.cnn.com/2006/WORLD/europe/11/08/atheism.feature/index.html. Retrieved 2010-03-16. ^ Gribbin, Alice (22 December 2011). "Preview: The Four Horsemen of New Atheism reunited". New Statesman. Retrieved on 2012-02-13. ^ Garfield, Alan E. "Finding Shared Values in a Diverse Society: Lessons From the Intelligent Design Controversy". Vermont Law Review 33 Book 2. Retrieved on 2013-11-21. ^ "Major Religions of the World Ranked by Number of Adherents, Section on accuracy of non-Religious Demographic Data". Archived from the original on 22 April 2011. http://www.adherents.com/Religions_By_Adherents.html#Nonreligious. Retrieved 2011-04-09. ^ Huxley, Andrew (2002). Religion, Law and Tradition: Comparative Studies in Religious Law. Routledge. p. 120. ISBN 978-0-700-71689-0. https://books.google.com/books?id=YsUMTA4MebwC&pg=PA120. Retrieved 2011-04-09. ^ a b "Religion: Year in Review 2010: Worldwide Adherents of All Religions". Encyclopædia Britannica Online. Encyclopædia Britannica Inc.. http://www.britannica.com/EBchecked/topic/1731588/Religion-Year-In-Review-2010/298437/Worldwide-Adherents-of-All-Religions. Retrieved 2013-11-21. ^ Joas, Hans; Wiegandt, Klaus, eds (2010). Secularization and the World Religions. Liverpool University Press. p. 122 (footnote 1). ISBN 978-1-84631-187-1. https://books.google.com/books?id=rQTdki1xyK0C&pg=PA122. Retrieved 2012-04-18. ^ "WIN-Gallup International "Religiosity and Atheism Index" reveals atheists are a small minority in the early years of 21st century". 6 August 2012. Archived from the original on 25 August 2012. https://web.archive.org/web/20120825005955/http://www.wingia.com/en/news/win_gallup_international_ae_religiosity_and_atheism_index_ao_reveals_atheists_are_a_small_minority_in_the_early_years_of_21st_century/14. Retrieved 2012-08-28. ^ "Wayback Machine". 2017-11-14. http://www.wingia.com/web/files/news/370/file/370.pdf. ^ "GLOBAL INDEX OF RELIGION AND ATHEISM – Press Release". Gallup – Red C. Archived from the original on 16 October 2012. https://web.archive.org/web/20121016062403/http://redcresearch.ie/wp-content/uploads/2012/08/RED-C-press-release-Religion-and-Atheism-25-7-12.pdf. ^ "Special Eurobarometer: Biotechnology" (PDF). October 2010. p. 381. Archived from the original on 15 December 2010. https://web.archive.org/web/20101215001129/http://ec.europa.eu/public_opinion/archives/ebs/ebs_341_en.pdf. ^ "Discrimination in the EU in 2012", Special Eurobarometer, 383 (European Union: European Commission): p. 233, 2012, archived from the original on 2 December 2012, https://web.archive.org/web/20121202023700/http://ec.europa.eu/public_opinion/archives/ebs/ebs_393_en.pdf, retrieved 14 August 2013 The question asked was "Do you consider yourself to be...? ", with a card showing: Catholic, Orthodox, Protestant, Other Christian, Jewish, Muslim, Sikh, Buddhist, Hindu, Atheist, and non-believer/agnostic. Space was given for Other (SPONTANEOUS) and DK. Jewish, Sikh, Buddhist, Hindu did not reach the 1% threshold. ^ a b c "Religiously Unaffiliated". Pew Research Center's Religion & Public Life Project. 18 December 2012. http://www.pewforum.org/global-religious-landscape-unaffiliated.aspx. ^ "Religion In Australia". Australian Bureau of Statistics. 27 June 2017. http://www.abs.gov.au/AUSSTATS/abs@.nsf/mediareleasesbyReleaseDate/7E65A144540551D7CA258148000E2B85?OpenDocument. Retrieved 2017-06-27. ^ a b "WVS Database". Institute for Comparative Survey Research. March 2015. http://www.worldvaluessurvey.org/WVSOnline.jsp. ^ Hout, Michael; Smith, Tom (March 2015). "Fewer Americans Affiliate with Organized Religions, Belief and Practice Unchanged: Key Findings from the 2014 General Social Survey". NORC. http://www.norc.org/PDFs/GSS%20Reports/GSS_Religion_2014.pdf. ^ "'Nones' are now the biggest religious group in the US - with families torn on priorities" (in en). https://www.christiantoday.com/article/nones-are-now-the-biggest-religious-group-in-the-us-with-families-torn-on-priorities/118935.htm. ^ "DN American Family Survey 2017" (in en). https://www.deseretnews.com/american-family-survey/2017. ^ "America's Changing Religious Identity" (in en-US). PRRI. https://www.prri.org/research/american-religious-landscape-christian-religiously-unaffiliated/. ^ a b c "The rise of Arab atheism". https://newhumanist.org.uk/articles/4898/the-rise-of-arab-atheism. Retrieved 2016-02-08. ^ Lynn, Richard (2009). "Average intelligence predicts atheism rates across 137 nations". Intelligence 37: 11–15. DOI:10.1016/j.intell.2008.03.004. Retrieved on 2015-05-25. ^ Barber, Nigel (4 May 2010). "The Real Reason Atheists Have Higher IQs: Is Atheism a Sign of Intelligence?". Psychology Today. https://www.psychologytoday.com/blog/the-human-beast/201005/the-real-reason-atheists-have-higher-iqs. ^ (19 December 2017) "The Negative Relationship between Reasoning and Religiosity Is Underpinned by a Bias for Intuitive Responses Specifically When Intuition and Logic Are in Conflict". Frontiers in Psychology 8. DOI:10.3389/fpsyg.2017.02191. ^ Carey, Benedict (7 August 2017). "The Serial Killer Test: Biases Against Atheists Emerge in Study". The New York Times. https://www.nytimes.com/2017/08/07/health/atheists-religion-study.html. Retrieved 2018-01-23. ^ Paris, Agence France-Presse in (7 August 2017). "Atheists tend to be seen as immoral – even by other atheists: study". the Guardian. https://www.theguardian.com/world/2017/aug/07/anti-atheist-prejudice-secularity. Retrieved 2018-01-23. ^ (7 August 2017) "Global evidence of extreme intuitive moral prejudice against atheists". Nature Human Behaviour 1 (8): 0151. DOI:10.1038/s41562-017-0151. ^ "10 facts about atheists". 1 June 2016. http://www.pewresearch.org/fact-tank/2016/06/01/10-facts-about-atheists/. Retrieved 2018-01-23. Cite error: <ref> tag with name "hume-metaphysics" defined in <references> is not used in prior text. Cite error: <ref> tag with name "reldef" defined in <references> is not used in prior text. Cite error: <ref> tag with name "oxdicphil" defined in <references> is not used in prior text. Cite error: <ref> tag with name "religioustolerance" defined in <references> is not used in prior text. Cite error: <ref> tag with name "honderich" defined in <references> is not used in prior text. Cite error: <ref> tag with name "holyoake-question-of-probability" defined in <references> is not used in prior text. Cite error: <ref> tag with name "besant-open-to-new-truth" defined in <references> is not used in prior text. Cite error: <ref> tag with name "barker-agnostic-atheism" defined in <references> is not used in prior text. Cite error: <ref> tag with name "flint-agnostic-atheism" defined in <references> is not used in prior text. Cite error: <ref> tag with name "agnosticism-compatible" defined in <references> is not used in prior text. Cite error: <ref> tag with name "BBC-2004-demographics" defined in <references> is not used in prior text. Cite error: <ref> tag with name "martin-agnosticism-entails" defined in <references> is not used in prior text. Cite error: <ref> tag with name "RoweRoutledge" defined in <references> is not used in prior text. Cite error: <ref> tag with name "encyc-unbelief-compatible" defined in <references> is not used in prior text. Cite error: <ref> tag with name "encyc-philosophy" defined in <references> is not used in prior text. Cite error: <ref> tag with name "eb1911-atheism-sceptical" defined in <references> is not used in prior text. Cite error: <ref> tag with name "eb1911-atheism" defined in <references> is not used in prior text. Cite error: <ref> tag with name "eb2007-demographics" defined in <references> is not used in prior text. Cite error: <ref> tag with name "eb2011-Rejection-of-all-religious-beliefs" defined in <references> is not used in prior text. Cite error: <ref> tag with name "eb2011concise-atheism" defined in <references> is not used in prior text. Cite error: <ref> tag with name "eb2011-atheism-critique" defined in <references> is not used in prior text. Cite error: <ref> tag with name "eb2011-atheism" defined in <references> is not used in prior text. Cite error: <ref> tag with name "encyc-unbelief-def-issues" defined in <references> is not used in prior text. Barker, Dan (2008). Godless: How an Evangelical Preacher Became One of America's Leading Atheists. New York: Ulysses Press. ISBN 978-1-569-75677-5. Dawkins, Richard (2006). The God Delusion. Bantam Press. ISBN 0-59305548-9. https://books.google.com/books?id=yq1xDpicghkC&lpg=PP1&dq=The%20God%20Delusion&pg=PP1#v=onepage&q&f=true. Flynn, Tom, ed (25 October 2007). "The new encyclopedia of unbelief". The New Encyclopedia of Unbelief. Prometheus Books. ISBN 978-1-591-02391-3. https://books.google.com/books?id=YR4RAQAAIAAJ. Harris, Sam (19 September 2006). Letter to a Christian Nation. Knopf. ISBN 978-0-307-27877-7. https://books.google.com/books?id=RlZATs3xD0gC&lpg=PP1&pg=PP1. Hitchens, Christopher (2007). god Is Not Great: How Religion Poisons Everything. Random House. ISBN 978-0-771-04143-3. https://books.google.com/books?id=sGgoYfGyqSMC&lpg=PP1&pg=PP1. Landsberg, Mitchell (28 September 2010). "Atheists, agnostics most knowledgeable about religion, survey says". Los Angeles Times. Archived from the original on 11 May 2011. https://web.archive.org/web/20110511180716/http://articles.latimes.com/2010/sep/28/nation/la-na-religion-survey-20100928. Retrieved 2011-04-08. Martin, Michael (1990). Atheism: A Philosophical Justification. Philadelphia: Temple University Press. ISBN 978-0-877-22642-0. Archived from the original on 19 May 2011. https://books.google.com/books?id=MNZqCoor4eoC&lpg=PP1&dq=Atheism%3A%20A%20Philosophical%20Justification&pg=PP1#v=onepage&q&f=true. Retrieved 2011-04-09. Martin, Michael, ed (2006). The Cambridge Companion to Atheism. Cambridge: Cambridge University Press. ISBN 0-52184270-0. https://books.google.com/books?id=tAeFipOVx4MC&pg=PA8#v=onepage&q&f=true. Retrieved 2013-11-25. Nielsen, Kai (2013). "Atheism". Encyclopædia Britannica. http://www.britannica.com/EBchecked/topic/40634/atheism. Retrieved 2013-11-25. Rowe, William L. (1998). "Atheism". In Edward Craig. Routledge Encyclopedia of Philosophy. Taylor & Francis. ISBN 978-0-415-07310-3. https://books.google.com/?id=lnuwFH_M5o0C&pg=PA530. Retrieved 2011-04-09. Sartre, Jean-Paul (2004) . "An existentialist ethics". In Gensler, Harry J.; Spurgin, Earl W.; Swindal, James C.. Ethics: Contemporary Readings. London: Routledge. p. 127. ISBN 0-41525680-1. Smith, George H. (1979). Atheism: The Case Against God. Buffalo, New York: Prometheus Books. ISBN 0-87975124-X. Stenger, Victor J. (22 September 2009). The New Atheism: Taking a Stand for Science and Reason. Prometheus. ISBN 1-59102751-9. Archived from the original on 11 October 2012. https://web.archive.org/web/20121011014538/http://www.colorado.edu/philosophy/vstenger/battle.html. Retrieved 2009-07-23. Berman, David (1990). A History of Atheism in Britain: From Hobbes to Russell. London: Routledge. ISBN 0-41504727-7. https://books.google.com/books?id=Li4OAAAAQAAJ&lpg=PP1&dq=A%20History%20of%20Atheism%20in%20Britain%3A%20From%20Hobbes%20to%20Russell&pg=PP1#v=onepage&q&f=true. Bullivant, Stephen; Ruse, Michael, eds (2013). The Oxford Handbook of Atheism. Oxford UP. ISBN 9780199644650. https://books.google.com/books?id=jbIVAgAAQBAJ&pg=PA267. Tom Flynn, ed (2007). The New Encyclopedia of Unbelief. Buffalo, NY: Prometheus Books. ISBN 1-59102391-2. Gaskin, J.C.A., ed (1989). Varieties of Unbelief: From Epicurus to Sartre. •New York: Macmillan. ISBN 0-02340681-X. Germani, Alan (15 September 2008). "The Mystical Ethics of the New Atheists". The Objective Standard 3 (3). Retrieved on 2011-04-09. Harris, Sam (2 October 2007). "The Problem with Atheism". The Washington Post. Archived from the original on 24 May 2011. https://web.archive.org/web/20110524071308/http://newsweek.washingtonpost.com/onfaith/panelists/sam_harris/2007/10/the_problem_with_atheism.html. Retrieved 2011-04-09. (2012) "The evolution of atheism: Scientific and humanistic approaches". History of the Human Sciences 25 (3). DOI:10.1177/0952695112441301. Le Poidevin, R. (1996). Arguing for Atheism: An Introduction to the Philosophy of Religion. London: Routledge. ISBN 0-41509338-4. https://books.google.com/books?id=M4YlYZi_cMUC&printsec=frontcover. Maritain, Jacques (1952). The Range of Reason. London: Geoffrey Bles. Archived from the original on 7 April 2013. https://web.archive.org/web/20130407012751/http://www3.nd.edu/Departments/Maritain/etext/range.htm. Retrieved 2013-04-15. Martin, Michael (1990). Atheism. A Philosophical Justification. Philadelphia: Temple University Press. ISBN 0-87722943-0. https://books.google.com/books?id=MNZqCoor4eoC&printsec=frontcover. Michael Martin & Ricki Monnier, ed (2003). The Impossibility of God. Buffalo, NY: Prometheus Books. ISBN 1-59102120-0. Michael Martin & Ricki Monnier, ed (2006). The Improbability of God. Buffalo, NY: Prometheus Books. ISBN 1-59102381-5. McTaggart, John; McTaggart, Ellis (1930) . Some Dogmas of Religion (New ed.). London: Edward Arnold & Co.. ISBN 0-54814955-0. Onfray, Michel (2007). Atheist Manifesto. New York: Arcade Publishing. ISBN 978-1-559-70820-3. Archived from the original on 30 October 2015. https://books.google.com/books?id=QpEAYMo7pFkC&lpg=PP1&dq=Atheist%20Manifesto&pg=PP1#v=onepage&q&f=true. Retrieved 2011-04-09. Oppy, Graham (2006). Arguing about Gods. Cambridge University Press. ISBN 0-52186386-4. https://books.google.com/books?id=DlVtfUxPD14C&printsec=frontcover. Robinson, Richard (1964). An Atheist's Values. Oxford: Clarendon Press. ISBN 0-19824191-7. Archived from the original on 25 April 2011. https://web.archive.org/web/20110425091126/http://www.positiveatheism.org/hist/athval0.htm. Retrieved 2011-04-09. Russell, Paul (11 February 2013). "Hume on Religion". In Edward N. Zalta. Stanford Encyclopedia of Philosophy (2013 ed.). Metaphysics Research Lab. http://plato.stanford.edu/entries/hume-religion/. Retrieved 2013-11-24. Zuckerman, Phil, ed (2010). Atheism and secularity. Santa Barbara, Calif. [u.a. ]: Praeger. ISBN 978-0-313-35183-9. Atheism at the Open Directory Project – Includes links to organizations and websites.